Mango is a delicious fruit, and although I like it fresh, I love it even more when it is dried or cooked. I used my Tefal Actifry to make this tasty snack, but if you don't have one, then a frying pan will work just as well. It just requires a bit more attention on your part to turn it over when it starts to brown (a real chore, I know). Peel the mango, and slice it into strips. Put it in the Actifry (or frying pan), and sprinkle over the lemon juice and sesame seed oil. Allow to cook until it turns golden brown. 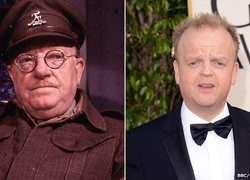 Are you excited to see a new Dad's Army movie?